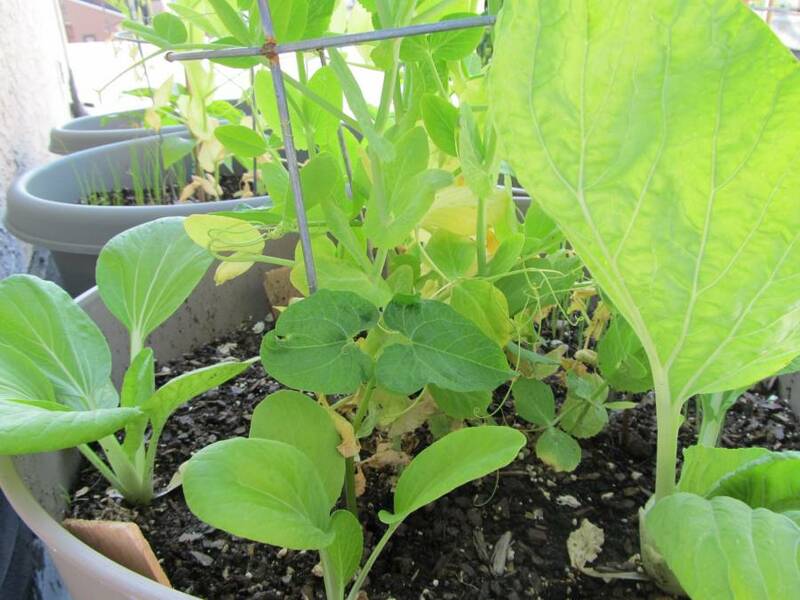 There’s still a fair bit of greenery on the rooftop, but the snow peas, bok choy, and spinach are done for the season, and the green beans, peppers, and pai-tsai are starting to come in… but not as quickly as I would like. I think that’s going to be a recurring theme on the rooftop garden until I figure out how to provide a little more protection from the sun and a better watering method. 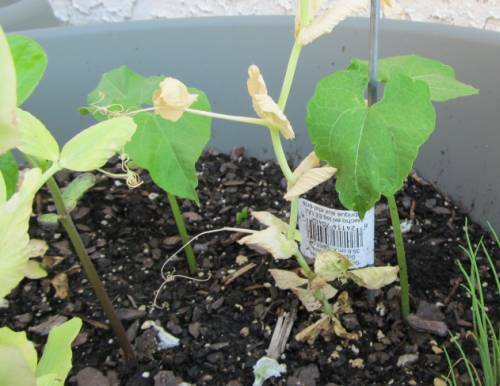 I may also need to find pots with better drainage — I realized after watching green bean leaves shrivel up and turn yellow/brown and pepper leaves fold up at the edges that I may have been overwatering. Anyway, I got enough snow peas to make 2-3 meals. Hopefully I’ll get a better yield when I try again this fall. 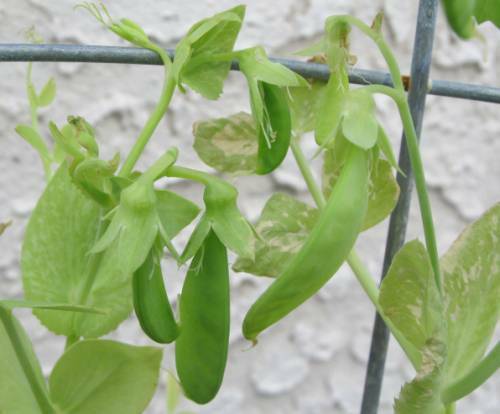 The few peas that we did get were absolutely delicious though so it was worth the time and effort to grow them, I guess. Oh yeah, and it was also a learning experience. 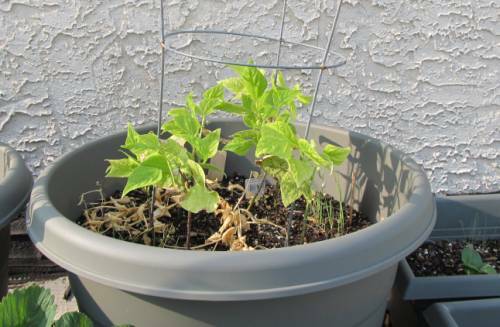 In late May I pre-sprouted some green bean seeds and then stuck them in the soil. They shot up like nobody’s business within just a few days. 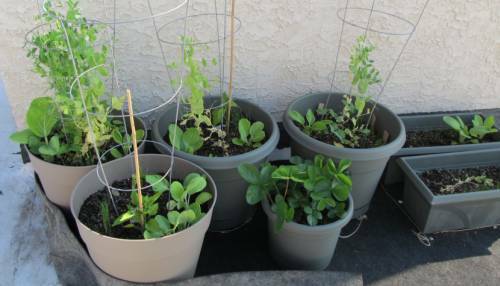 For a little while the beans were living peacefully with the bok choy and snow peas in a container garden that was overflowing with green. A little over a month has passed since I took that photo, and the rooftop looks quite different now. The beans and peppers have taken over. 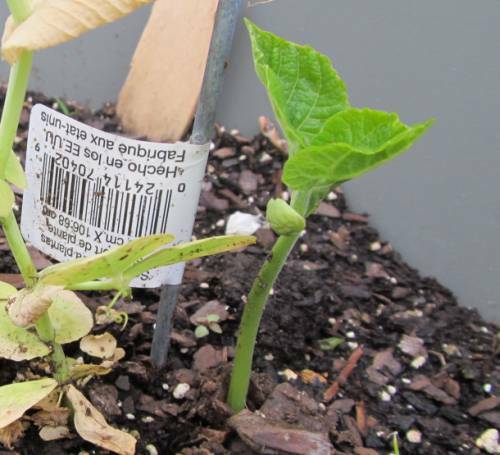 I’ve removed the snow peas and placed the stalks around the soil for mulch — although there’s probably not really enough of them to make any impact. 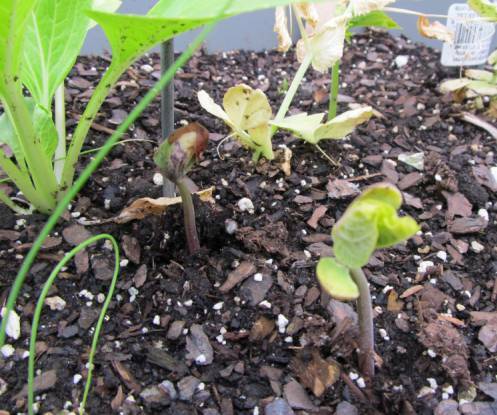 The beans which shot up quickly haven’t grown nearly as tall as I would have expected. I suspect that might have something to do with my having overwatered them early on. The brown leaves are starting to give way to healthier looking green foliage, but I would have expected the plants to grow more before flowering. 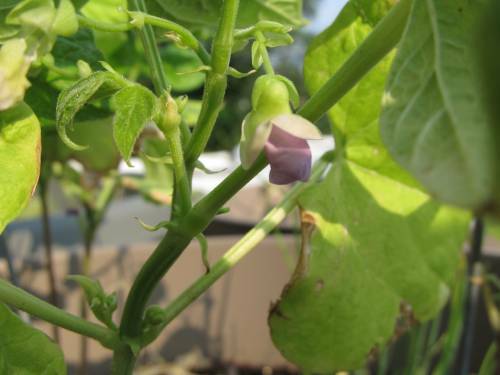 Still, it looks like we’ve got a few tiny green beans headed our way. 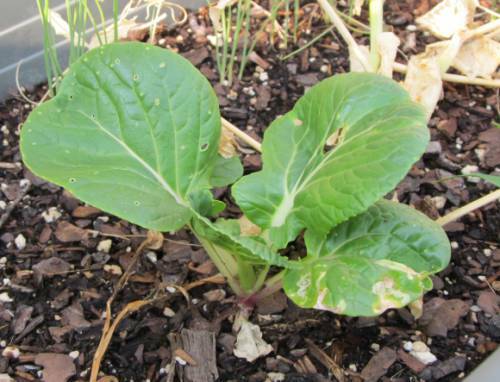 I’m not holding out hope to get a huge crop, but I’d like to be able to cook at least a meal or two. 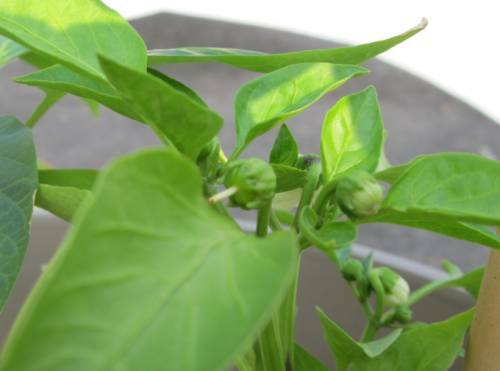 One of the pepper plants has also started to grow a real pepper, and it looks like a few more may be on the way. Again, the plant is shorter than I would have expected. I might have to do some homework to figure out if it will continue growing once it bears fruit or if there’s any advantage to snipping off the tiny little peppers before it drains too many of the plant’s resources. 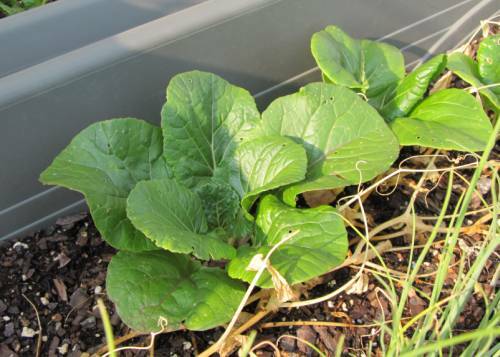 As promised on the package, the pai-tsai greens I bought at the Asian supermarket do seem to be thriving in the summer, unlike the bok choy I grew this spring, which is a cool weather vegetable. Unfortunately I don’t seem to be the only one who’s noticed. 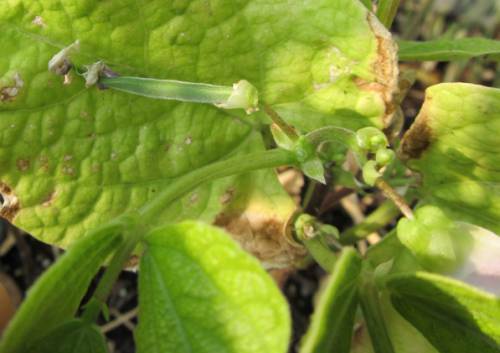 The leaves are riddled with holes that appear to have been chewed by bugs. I’ve been spraying the plans periodically with garlic-infused water, but I might have to look for something a bit stronger. I’d like to keep things organic, so I don’t plan to use any pesticides though. The leaf-to-hole ratio is actually getting better as the plants grow. When they were tiny, it seemed like the leaves were covered in chewed-up holes. It looks like as they grow larger the bugs are having a harder time keeping up. Or maybe the garlic water really is doing the trick. I’m not sure if I’ll actually end up eating any of the pai-tsai at this point, but I’m trying to decide if it’s good to have something that the bugs like to eat hanging around so that they won’t chew on the peppers and beans, or if I should get rid of the leafy greens so that maybe the leaf-eaters will just go away. 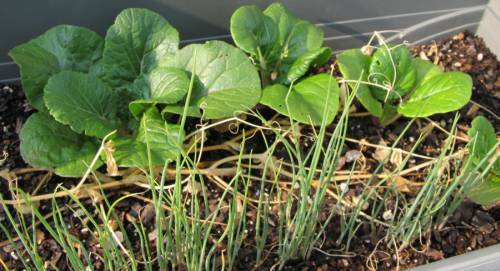 The onions are continuing to grow in… but I think I may have bunched them too close together initially. They seem to perk up a bit when I thin them out a bit. I probably need to do more of that. So far the summer season has been more about learning and experimenting than harvesting and eating. But the summer is still young.